BOOM spoke to lawyers who were of the opinion that holding WhatsApp admins liable for group members posting objectionable content is misuse of criminal law. After the government’s notice to WhatsApp to take immediate steps to contain fake news and misuse of its platform, several messages are making rounds on social media cautioning people that they can be arrested for forwarding objectionable or fake messages. These messages claim that the government and the police are keeping watch on WhatsApp groups. Click here to read BOOM’s story from last week. Yet another message which is more extensive in its claims was forwarded to us by an user to check for veracity. 1) Do not forward photos of political leaders – ‘Sonia, Rahul, Modi, Kejriwal’ or that ‘ridicule religious, political, social system or bad pictures or videos or ‘damaging messages pertaining to personal details, personal, nationality, religion, sect, radical, customs, geographical area’. 2) ‘Police are watching WhatsApp’ and ‘Cyber Crime are watching all group folders’. 3) Police have already arrested an admin in Pune and was sent to jail for a year. In Mumbai cyber crime arrested 36 members of a WhatsApp group who shared a video and photo. 4) Forwarding such messages is non-bailable offence with a 7 years punishment. 5) An investigation committee is formed to track communal posts and it will be punished under section 44-58 or CPC by tracing the IP address. The accused will be arrested with any warranty. The group admin will be punished under Section 59. Thus, the message advises the group admins to either delete the group or remove the person who sends such messages. 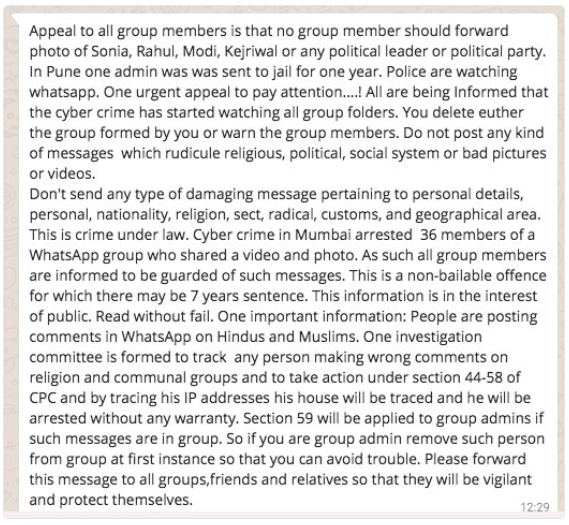 On Facebook this message is being widely shared along with a 27-second video clipping of an IPS officer speaking about how WhatsApp group admins can be held accountable for any objectionable forwards by group members. However, the officer TK Vidhyarthi, SP of Neemuch district in Madhya Pradesh does not talk about any other claims made in the message. Click here to view the clip. What we see in the message are mixed claims with the purpose to create a scare among WhatsApp users and an attempt to make it sound genuine by referring to certain incidents and legal provisions out of context. However, since the police are making attempts to tackle the issue of fake news that is spread via WhatsApp and the government is pushing for more surveillance, these messages fall in a grey area. The country has recorded 23 mob lynching cases triggered by child-lifting rumours based on WhatsApp rumours in the first six months of 2018, according BOOM’s compilation. BOOM explores the question of WhatsApp admins’ liability over objectionable messages by talking to legal experts and police. 1) Is the message fake? The message is fake on multiple counts. BOOM spoke to Balsing Rajput, SP, State Cyber Crime of Maharashtra who said that the message is fake because police cannot keep a watch on the information passed around on WhatsApp, especially groups, as the platform is end to end encrypted. The only way for police officials to monitor any WhatsApp group is if they manage to be present on any of the groups or objectionable content is brought to their notice by either the admins or the members. BOOM could not find media reports of the specific cases mentioned in the message which claims that WhatsApp admins were arrested from Pune and Mumbai. The legal provisions mentioned in the message – sections 44-58 CPC are incorrect. BOOM spoke to cyber security lawyer Apar Gupta who confirmed the same. 2) Have the Police arrested WhatsApp admins in the past? Yes, there have been cases of arrests of WhatsApp group admins and members for objectionable messages. Here are few instances, according to media reports. Ansar (20) and Rashid (22), from Kairana, Uttar Pradesh were arrested in July 2018 for being admins of a group in which communal photos were shared. They were booked under IPC sections 295 (Injuring or defiling place of worship with intent to insult the religion of any class) and 505 (Whoever makes, publishes or circulates any statement, rumour or report to create ill-will or enmity ). Ram Singh (28), the group admin was arrested along with a member who shared objectionable images on the group in Kasganj, Uttar Pradesh in February 2018 under IPC section 153A (Promoting enmity between different groups on ground of religion, race, place of birth, residence, language). Karnataka police arrested the group admin of a group for posting a picture of Prime Minister Modi with obscene content in May 2017. The arrests were made on charges of spreading hate speech, false information and inciting communal enmity. 3) What do legal experts say about holding WhatsApp admins responsible? 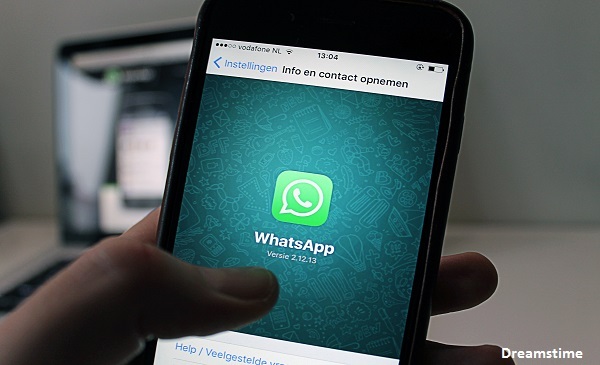 BOOM spoke to two lawyers who were of the opinion that WhatsApp admins cannot be held liable. “WhatsApp admins should not be held liable. These are groups of college alumni, friends, and family and not created with a criminal intent. The admins would not know what the members will post in future.” He said that arresting WhatsApp admins is setting an incorrect practice and is inspiring scare and pre-censorship. Thus, the bigger question here is if there is an element of conspiracy. 4) Can WhatsApp admins be arrested for not deleting the messages or removing the member, who sent objectionable content from the group? Police officials dealing with day to day policing challenges seem to think that admins can be made liable for failing to regulate fake news and hate speech. But lawyers say that the admin should not be held liable for failing to delete such content as deletion also means destroying evidence, which is punishable under Section 204 of IPC. “If a hate speech is posted on WhatsApp group, it’s deletion may also amount to destruction of evidence. If no one has saved the message or taken a screenshot, then the evidence of hate speech will disappear the moment the messages are deleted by the group admin. Therefore, a WhatsApp group admin cannot be held liable if he does not delete the hate speech. Because if he deletes the hate speech, he may be punished for destruction of evidence under section 204 IPC. Yes, you are effectively putting a WhatsApp group admin between the devil and the deep sea. This is completely unacceptable and uncalled for,” said Abha Singh to BOOM. 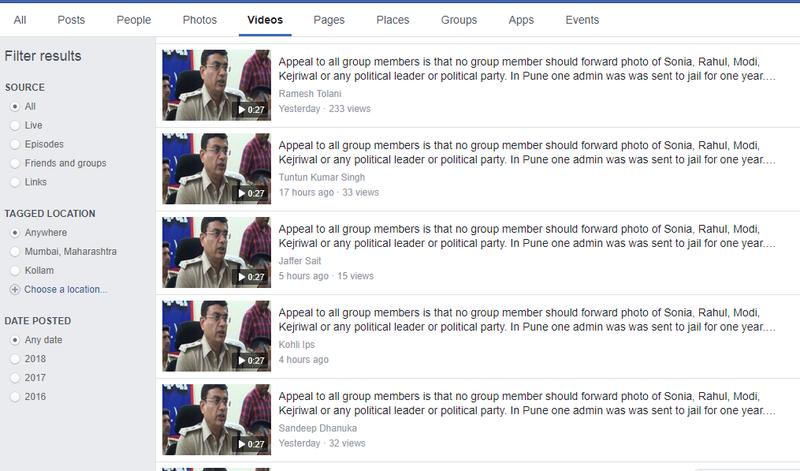 5) What can group admins do to avoid such situations? Admins or even members can report hate speech or other objectionable content to the nearest police station. However under section 39 of the CRPC, there is no such obligation. Thus, the police has no power as per law to arrest people for not reporting a hate speech that is put up on the group, say lawyers.